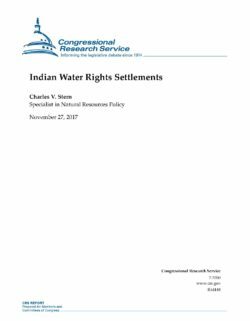 This report provides an overview of Indian water rights settlements. It analyzes issues surrounding water rights settlements and the negotiation process, as well as implementation challenges and related issues for Congress. Instead of managing fresh water as one integrated resource, laws frequently treat groundwater separately from more visible, monitored, and managed surface waters. One under-recognized consequence of such legal fragmentation has been uncertainty about whether water rights for indigenous communities, which have been addressed in many countries to varying degrees for surface waters, apply to groundwater. In late 2017, the U.S. Supreme Court left standing a lower court ruling endorsing priority groundwater rights for Native American tribes by denying an appeal in Agua Caliente Band v. Coachella Valley Water District. This ruling establishes a new standard throughout nine western states within the lower court's jurisdiction and establishes persuasive, although nonbinding, legal precedent for the rest of the United States. 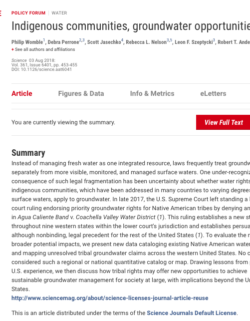 To evaluate the ruling's broader potential impacts, we present new data cataloging existing Native American water rights and mapping unresolved tribal groundwater claims across the western United States. No court considered such a regional or national quantitative catalog or map. Drawing lessons from past U.S. experience, we then discuss how tribal rights may offer new opportunities to achieve sustainable groundwater management for society at large, with implications beyond the United States. *The full text of this paper is behind a Science Magazine pay wall at a single-issue cost of $15. It should be available for free through research portals at universities, and may be accessible through public libraries with Science Magazine subscriptions. A free summary is contained by the August 3, 2018 Stanford News report "Stanford study reveals the changing scope of Native American groundwater rights – and opportunities for better freshwater management."